After our first Miniature Schnauzer puppy, our interest in the breed grew and soon we added a black female named Becky to the pack. It was shortly after Becky that we discovered Toy Schnauzers. 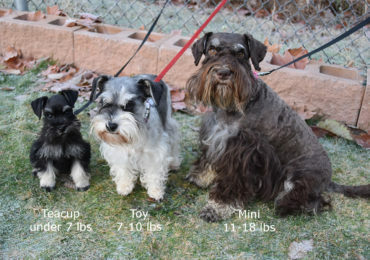 The size and unique colors available in this "downsized" version of the Miniature Schnauzer once again garnered our attention and soon, Oreo and Cooper were added to the mix. 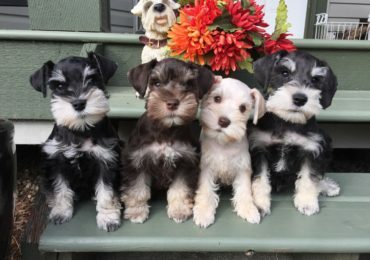 I am an at-home mom and all our Miniature Schnauzer puppies are raised in our home with attention from all members of our family, friends and neighbors. As you can well imagine, our household is a popular one after school when there are Schnauzer puppies in the house!! Although we now have many dogs in our breeding program, all the dogs have their own families to love and care for them on a full-time basis. The only time they live with us is when they are needed for breeding and once the female is due to have her puppies. Cooper is our family pet and "surrogate uncle", "father" or "grandfather" to the puppies. By running our breeding program this way, rather than having it set up as a kennel, all our dogs are well mannered, well socialized, friendly family pets and their wonderful temperaments are passed down to their puppies. Miniature Schnauzers are people dogs and kennels don't suit them. They want to be with their people and be involved in everything that is going on in the household. By having their own families, they each get the time and attention they need and deserve and everyone benefits. 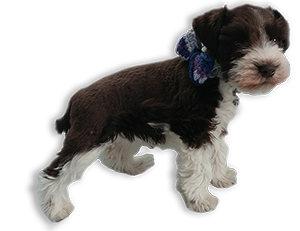 We have collected our Miniature Schnauzer parents from top breeders in the USA who have been breeding healthy, quality Miniature Schnauzers for many, many years. The expense has been worth it in the healthy, quality puppies we have produced over the years. We look forward to each litter with great anticipation and continue to strive to breed puppies to meet the breed standard for temperament and structure with the added bonus of producing this unique breed in smaller sizes and rare colors. 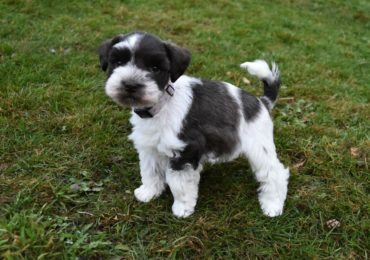 When we choose to keep one of our Schnauzer puppies to add to our breeding program, it is only after we have evaluated the temperament, structure etc. of the puppy to make sure it meets or exceeds our expectations. We breed only Miniature Schnauzers and Toy Schnauzers as I couldn't imagine working with any other breed. Explore our website and enjoy seeing our dogs, puppies and learning about what we do that makes us different from your average Miniature Schnauzer breeder. I think you'll find it's time well spent. Want to purchase a puppy?